Too bad i didn't won the contest.. But hey, I am super happy with this Remix of my hero B-Front! 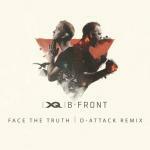 B-Front - Face The Truth (D-Attack​ Remix) FREE DOWNLOAD!